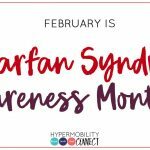 There is so much confusion in our community about hypermobility diagnoses following the release of new criteria in March 2017. 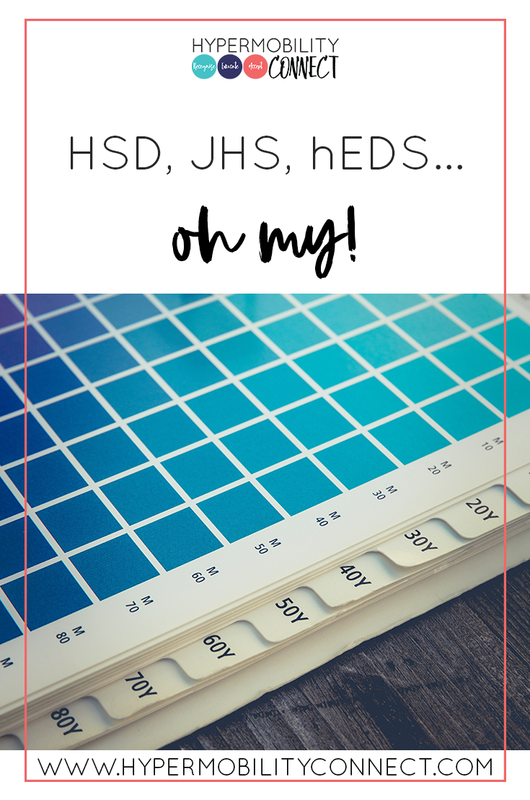 Is it HSD, JHS, hEDS… which is it? Here’s a little summary for you – feel free to post any questions you have in the comments and I will do my best to explain it (if I can!!). 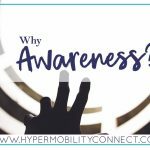 What is Hypermobility Spectrum Disorder (HSD)? These are referred to as the secondary musculoskeletal manifestations. Hypermobility of the joints is the symptom which ties the Hypermobility Spectrum Disorders together under this umbrella term. 4. Generalised joint hypermobility spectrum disorder (G-HSD): where there is a positive Beighton score, plus one or more of the above mentioned secondary musculoskeletal manifestations, but does not meet the criteria for Hypermobile EDS. There is sometimes an extension to other organs and tissues, but this is usually seen in a limited way (as compared with Hypermobile Ehlers-Danlos Syndrome). The best way of thinking about this is “the spectrum”, hence the name. What is Joint Hypermobility Syndrome? Joint Hypermobility Syndrome or JHS as it’s commonly called is a diagnosis which was given to patients who displayed a Beighton Score > 5 / 9 and met the Brighton Criteria for Joint Hypermobility Syndrome. As part of the attempt to more accurately describe Hypermobile Ehlers-Danlos Syndrome (hEDS), in early 2017, there were new criteria released for hEDS and from that, we gained new criteria and terminology for what was previously termed JHS. JHS is now called the Hypermobility Spectrum Disorders, as outlined above. This review was well overdue, after much confusion between hEDS and JHS and the interchangeable use of the diagnoses by many doctors. We now have a more accurate picture of what we currently know about hEDS and the HSDs. It has however caused a lot of confusion in the patient community about diagnoses. I can tell you know that it will take years, if not decades for the name change from JHS to HSD to filter through the medical ranks. Our aim is to help that happen more quickly and to help people living with these conditions understand their diagnosis. A number of other symptoms & syndromes have been found to be associated with hEDS. While these are not included in the diagnostic criteria, the presence of co-morbidities is not uncommon. The short answer: They all cause joint hypermobility and pain. HSD supersedes JHS, so we don’t use that term any longer (however doctors will be doctors and stick with their archaic ways, so be prepared to hear the wrong name for a while to come). There is a crossover in the secondary musculoskeletal manifestations, however, in hEDS there are more systemic manifestations (e.g. skin, nervous system, cardiovascular system, etc.). There is a crossover in the co-morbidities potentially experienced. Worth noting: Diagnosis of hEDS is not an exact science due to being unable to test genetically. That means the consortium of specialists who wrote these new criteria have done so on the current knowledge available. They have actually stated that there may be some fluidity in diagnoses on the spectrum, meaning that with fluctuation of symptoms, a patient may on assessment meet the criteria for G-HSD, however, their diagnosis may be borderline hEDS and should be monitored on a ‘loose’ follow up schedule to see that the current diagnoses of G-HSD remains current or if hEDS has now become apparent. That’s why there is an arrow between G-HSD & hEDS. The same is possible between diagnoses on the HSD ends of the spectrum. The joys of not yet knowing the molecular basis for these conditions! So many emotions about diagnoses! The criteria for hEDS are much more strict than they were prior to 2017. Is this good or bad? It’s good. It means that researchers will have access to a more pure pool of participants when conducting research relating to hEDS, which will hopefully help us narrow down the gene mutation involved. For people with HSD, even if you feel you got “demoted” from hEDS to HSD, or you “don’t quite make it” into the hEDS category, it should still mean you’re getting the right treatment and management. Treatment and management are symptom-focused regardless of the diagnosis. As strange as it may feel, not being diagnosed as hEDS when you don’t meet the current criteria means you’re helping the advancement of research for hEDS. That by default helps those with HSD. Once we know the genes involved, we are much closer to working out what is going on in both categories. It may feel like a bit of a demotion, or a setback, or a whole bunch of strange emotions, but the reality is that as long as you have a diagnosis which most accurately describes your current symptoms, then you have the best chance of getting the most appropriate care. In my experience, HSDs and hEDS can present very similarly. We need to remember this one crucial thing: comparison does not help. There is no way of comparing your pain and my pain. My subjective experience is mine and mine alone. Yours is yours. Comparing achieves nothing. What matters is how we choose to deal with the symptoms and complications we have been dealt with. That’s what matters, and remember that is what is going to help you live your life WITH hypermobility, in a hopeful, healthy way. Hi Holly, Actually, Brighton Criteria is correct in this context. I was talking about the old diagnostic criteria which is called the Brighton Criteria. You are talking about the Beighton Scale out of 9 for measuring hypermobility.